In an effort to broaden my reading, two years ago my husband bought me a bunch of books for Christmas as a surprise. I blogged about reading these books blind (by blind I mean not reading the reviews or blurbs, so in effect knowing nothing about the books except its cover, title and author). It was such a fun experiment that I asked him to choose me five more books for this Christmas, and as I have just finished reading the last one I thought I would blog here about this year’s reading blind journey. 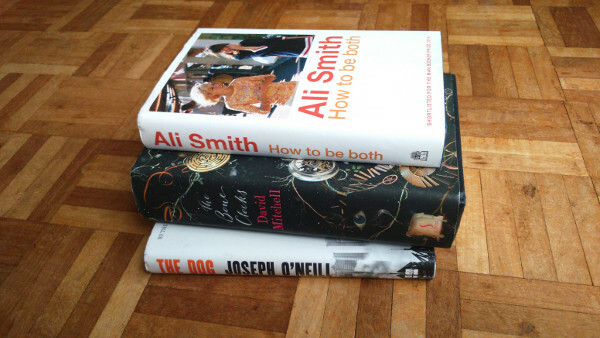 The five books were: The Hundred-Year-Old Man Who Climbed Out of the Window and Disappeared by Jonas Jonasson; H is for Hawk by Helen McDonald; How to be Both by Ali Smith; The Bone Clocks by David Mitchell and The Dog by Joseph O’Neil. I started with The Hundred-Year-Old Man because it sounded kind of jaunty and fun, and it was, up to a point. The story concerns an old man who escapes from his nursing home and gets involved with criminals so goes on the run with a motley crew of fellow misfits. This story in the present is then punctuated with flashbacks which tell the rather eventful life story of the main character Allan Karlsson. It was a really nice idea, but I just found it a bit too ‘Sweden’s answer to Forrest Gump’ for my liking. Allan Karlsson was not an especially sympathetic character and kept making rather dubious moral decisions as he bumbled through life. In sum it was an enjoyable book but it was a bit too much of a ‘caper’ for my tastes. Next I read H is for Hawk by Helen MacDonald which is a wonderful non-fiction account of training a goshawk as the author recovers from the death of her father. This is intermingled with a biography of the author T. H. White, who also trained a goshawk, but with rather different results. The beauty of MacDonald’s prose as she describes the challenge of training a hawk and the complicated emotions it awoke within in her was such a pleasure to read. The simple, yet soaring descriptions of the natural world and MacDonald’s thoughts and feelings were so insightful. This book was one of those rare books which you never want to end, I was so caught up in the story and really felt a connection with MacDonald’s relationship with the nature (it helped that she is describing the Cambridge countryside where I live). This is certainly non-fiction at its finest. My next book was also coincidentally partially set in Cambridge, How to be Both by Ali Smith. I really enjoyed this book, although at times I have to admit I wondered if I really understood exactly what was going on! The book is about a young girl who is struggling with the death of her mother. It is in part inspired by a photograph and a fresco and through these two starting-points mediums the story unfolds. Smith has crafted an exceptionally well-written book, using details of punctuation to capture the thoughts and style of her characters. There is a lovely balance between the realism of the main character and the more ethereal character of the fresco painter. It is the kind of book it would be great to read as part of a book group as I felt like I wanted to discuss the characters and what was happening with someone else to see if they were interpreting it in the same way as me. I am quite the David Mitchell fan so I was really excited to read The Bone Clocks. I was not disappointed but I did have a wobble near the beginning of the book when I realised this was probably Mitchell’s most sci-fi inspired novel yet. Mitchell sticks to the familiar theme of reincarnation and the sense of self. The story follows Holly as we journey with her through her life, starting the narrative from her perspective but then switching to other important people in her life as time moves forwards. What I really admire about Mitchell is his ability to craft believable characters. He switches easily between the differing narratives, building the story as he goes. The Bone Clocks is not as good as Cloud Atlas (but that is a supremely high bar!) but it is still a really great book and wonderful escapism. The last book of my five was The Dog by Joseph O’Neil. I had no idea what to expect from this book as I had not heard of the author and the jacket gave little away. It is essentially a book about a city boy who works for a very rich family in Dubai and explores the life of an ex-pat. There was certainly something Patrick Bateman-ish about him, which I think didn’t work in the book’s favour as that is a tough act to follow! Ultimately I felt like the book would be really funny and insightful if I were a city lawyer or a Dubai ex-pat. As I am neither I found it really hard to care about the main character or find much to relate to in his observations about ex-pat living. In conclusion, I really loved three of the books I read blind this year and was not so keen on the other two, so not a bad result for my husband. I really enjoy reading books that someone else has chosen for me as it forces me to read outside my comfort zone so I will definitely be continuing this Christmas tradition. I might ask for more of a mix of fiction and non-fiction next time though as I like to mix things up a bit. Have you read any of these books? What did you think of them? Please leave a comment! N.B. Eagle-eyed readers will have noticed I have only got three of the books in the photo, that is because I have already charity shopped The Hundred Year Old Man because I won’t read it again, and have lent H is for Hawk to my mum, because I hope she will love it as much as I did!